Home rubbish removal can become a bit of a headache at the best of times but no more so than when preparing to move. Whether the move is from one home to another or it involves moving offices or other premises, moving day can be made even more stressful by having to make arrangements for dealing with the rubbish. The very act of preparing to move creates rubbish. There are always the hidden horrors of loft clearance and going through the contents of garages, outhouses and sheds. These all attract things that were destined for future sorting, repair, re-cycling or plain dumping but never got the attention. Years of accumulated items that in the midst of preparing to move suddenly become unwanted junk and rubbish can create panic when finally faced. Getting rubbish to a local recycling centre isn’t of itself a major issue; but when the volume is large it can be stressful and extremely time-consuming. On top of that, large and heavy items will sometimes not only refuse to fit in the family car but can also cause damage to a vehicle. Packing can also create a lot of rubbish: items removed from original but damaged packing, leftover boxes that are no longer sturdy enough to hold objects, packing that is no longer needed and trimmed waste from new packing materials all add up. While there will always be the unexpected amount of rubbish generated in the last stages of preparing for a move it should be possible to assess the amount of rubbish to be disposed of. A good start is with larger items as these can be the most difficult and costly to remove and dispose of. Furniture that is old and is to be replaced should go at the top of the list. Then items that can be grouped together for recycling, such as card, paper, plastic and metal can be grouped. Sometimes it’s simply a matter of going around the property and putting things to one side for disposal. This strategy can be quick and effective but requires appropriate receptacles to put rubbish in during the process. If this is not done then piles of rubbish will very quickly take over and threaten to spill over everywhere. It’s also false economy of time to try to put things in small piles and small everyday plastic bags and boxes as they will be difficult and time-consuming to handle later. It’s much better to have purpose-made disposal receptacles that can hold a lot and be easily moved out of the building during rubbish removal. Organising rubbish removal just before moving can be a nightmare, especially if undertaken without professional help. It can be a false economy to try to do everything oneself. There are specialist companies that can help, such as Clearabee. This company offers a flexible service that ranges from one man and a van but also a range of rubbish containers that vary from skip bags to smaller containers. These can be ordered and delivered the day after and then the filled bags collected the day after delivery. This means a fast and easy way of rubbish removal without the need for finding things to contain it and of course getting rid of it afterwards. There is also peace of mind as Clearabee recycle over 90% of the rubbish they collect. 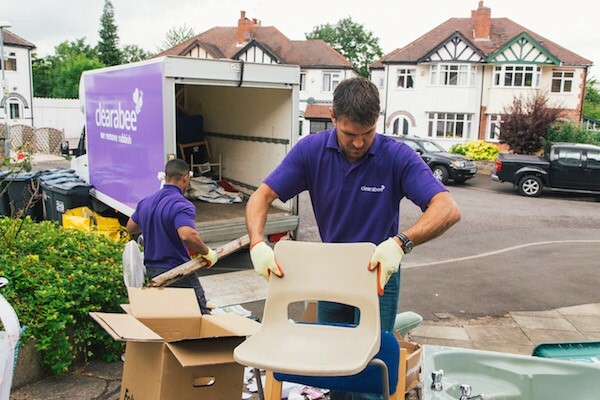 Using a service such as Clearabee’s offers flexibility and a fast solution to clearing out rubbish without the headaches and inconvenience of trying to do it all oneself.